Saturday Night: Wintry mix to rain after midnight. Lows in the 20s and 30s. Sunday: Predawn mix to rain showers, wintry mix continues over Northern New England. Highs near 50. Clouds will continue to thicken as the day goes on and we end up under a mostly cloudy sky this afternoon but at least it does stay dry. It is a great day to be outdoors! Highs today will be in the 30s to near 40. A strong area of low pressure is evolving over Central U.S., with snow over the upper Midwest while heavy rain falls in the Southern Plains and Tennessee Valley. All this energy will move towards New England late tonight and with cold air in place, we should start out with a few flakes over much of the region and then transition over to a wintry mix for the east slopes of the Berkshires, Central and Northern Massachusetts, Southern New Hampshire and all the way north into the Northeast Kingdom where up to a tenth of an inch of ice accretion is possible. In Boston and areas south of the Mass Pike, heavy rain will be falling by daybreak while towns north, will be dealing with some icing conditions until around midday making it very slick on the roads. 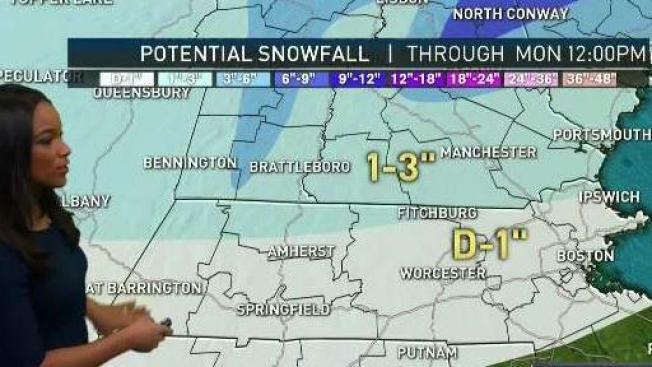 During this time, much of Northern New Hampshire and Maine will get all snow. For those driving to/and from school vacation, we recommend waiting until the evening when conditions improve. The heavy to moderate rain will taper off early afternoon in Southern New England but not after picking up close to an inch of rain along the South Coast, while the snow will continue to fall in Northern Maine-this is where six to nine inches of snow is expected. As this system pulls out, the wind will shift out of the west southwest and it will tap into mild air, allowing temperatures to rise into the upper 40s to low 50s. The pressure gradient will tighten as a high pressure builds in right behind this low, so a first alert has been declared Monday for gusts up to 60mph with the potential for downed trees and power lines which would lead to power outages. Highs on Monday will be in the 30s north, 40s south. High pressure settles over the region on Tuesday with decreasing wind and much colder air, highs will be running below normal for this time of year-mainly in the teens north and 20s south. The wind won’t be as strong but a light breeze will be present for wind chills in the single digits and teens. At least the sun will be shining bright. Our exclusive 10-day forecast looks to stay cold and fairly quiet much of the week, though there is a chance for a few snowflakes next weekend but it’s too early to make a final decision as to how much.